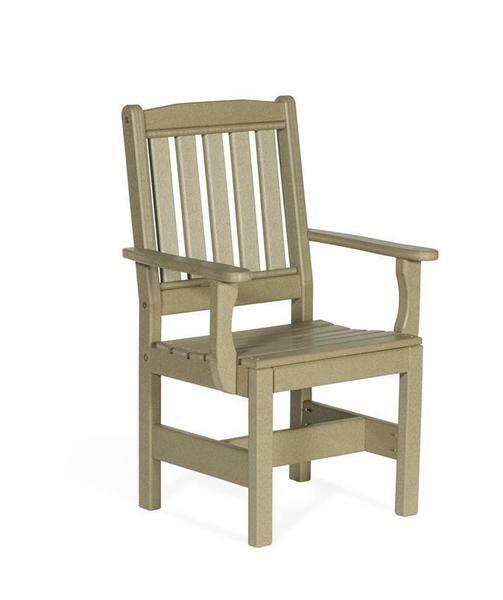 Perfect for outdoor dining or as a quiet seating space, our Amish Patio Recycled Poly Lumber English Garden Dining Chair will create an elegant space in your garden, backyard or patio area. Handcrafted from eco-friendly poly lumber by skilled Amish craftsmen, this American made chair is sure to last many decades! Complete your outdoor dining space with our Poly Square Dining Table, our Poly Lumber Trestle Table or the Poly Mission Dining Table. Please call with questions on our Amish Recycled Poly Lumber English Garden Dining Chair or other Amish outdoor furniture that we offer at DutchCrafters. Toll-Free (866) 272-6773. Arm Height (from floor to top of the arm): 26 1/2"
Height from seat to top of arm: 9"